The E-144 is a small version of the E-108, still it is a powerful effect for both clubs and mobile DJs. 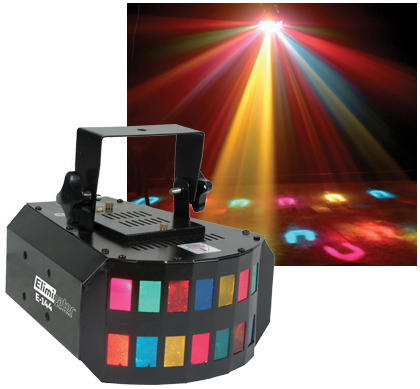 This unit features 2 x 120v 300w Lamps (EL-64514) that respond sound actively via its internal microphone.The effect creates a dramatic cluster of 32 multi-dichroic colored beams crisscrossing throughout the room. You cannot go wrong with the E-144. Dimensions: 17.322" x 12.401" x 9.842"